Zürich/Queensland, 22nd November 2018 — The agreement, the first of its kind in Australia, explores the use of RUAG Space’s new range of FlexLine carbon composite products in Gilmour Space’s proprietary hybrid rockets. The Queensland-based company is targeting to launch small satellites weighing up to 100 kg into low earth orbits from 2020, and up to 400 kg from 2021. RUAG Space is the leading supplier to the space industry in Europe, with a growing presence in the USA. With more than 1,300 staff across six countries, it develops and manufactures products for satellites and launch vehicles – playing a key role both in the institutional and commercial space market. RUAG Space is a division of the international technology Group RUAG. RUAG develops and markets internationally sought-after technology applications in the fields of aerospace and defence for use on land, in the air and in space. 56% of RUAG's products and services are destined for the civil market and 44% for the military market. The Group is headquartered in Bern (Switzerland). It has production sites in Switzerland and in 15 other countries in Europe, the USA and Asia-Pacific. RUAG generates sales of approximately CHF 1.96 billion and has over 9,200 employees – 400 of whom are trainees. 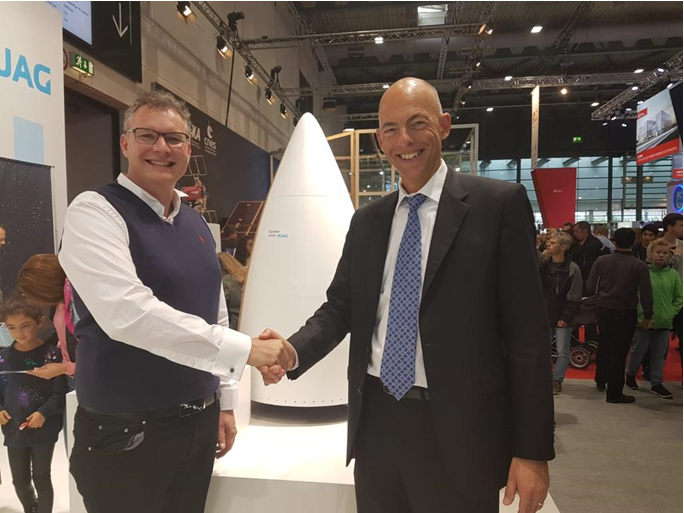 Image text: Holger Wentscher and Stephen Bury, Lead Engineer Gilmour Space, shaking hands upon the sound agreement between RUAG Space and Gilmour Space. Are you looking for another RUAG contact, please see our general contact page.